I’m Kathryn Blair, a first-year PhD student at the University of Calgary in Computational Media Design. My work focuses on exploring the role of algorithms in society. 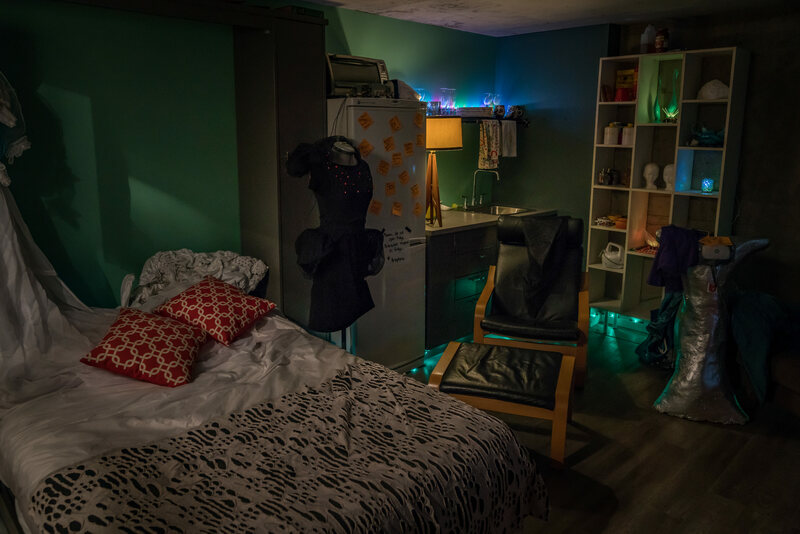 Persephone’s Bedroom was part of Mars 112 for Beakerhead 2017. Mars 112 was an installation that took over the Loft 112 literary arts space, lead by Gina Freeman with Nick Taylor, Andrew Sayer, Julia MacGregor, Steven Duggins, Cody Kupper, Stephen Holman, Ashley and Lauren Voisin and myself. My contribution to the project was Persephone’s Bedroom, which was the bedroom space of the main character of Mars 112, an astronaut named Persephone who has been monitoring robots for a bit too long. The installation included a sales uniform that became fancier – to appeal to potential Mars condo buyers – based on social media activity, and an exercise bike that harassed and cajoled the astronaut, Persephone, to keep active. These projects imagined some of the ways companies might use algorithmic systems to control their employees.